Somewhere along the line, sales and marketing people have lost sight of the big picture. Which is weird, because you would think all of this data we have at our fingertips would make us smarter about how we do things. In actuality however, data is making marketers focus on the wrong things. Data – even the name is ambiguous. How much is enough? Is there a point where data is too much? Because tools like marketing automation come right out of their shiny new box with high-level insights into behavioral data, many marketers focus on these new signals and as such, on what I call vanity metrics. Things like number of clicks, lead forms filled out, white papers downloaded and emails opened. In fact, too many marketers are measured largely on making those numbers a little bigger each month. Not that that’s a bad thing. It’s just they don’t really matter all that much if they don’t ultimately convert. Bigger vanity metrics are really nothing but numbers you can pat yourself on the back with. Everything that happens before a conversion is tripping us up, not because it’s unimportant but because it allows us a sense of accomplishment. Instead of focusing on sales, we’re focusing on precursor noise. We’re forgetting one of the most important points about data and leads in particular—more isn’t necessarily better. Case in point: When we talk to marketers it’s evident they are heavily addicted to a drug and that drug is events. The last frontier of physical interaction in a digital world. So, let’s say you make a huge effort to attend and exhibit at a large conference in your industry every year, spending thousands, even tens of thousands on various sponsorships and activities. Sure, you’re going to get some level of exposure. But you’re also going to be competing against a lot of other vendors and a lot of other noise. And while you might get a ton of “leads” with the handy conference badge scanner, the size and breadth of the event doesn’t exactly foster the opportunity to really figure out if you are talking to the right person. Big conferences cost a lot, and in the end, you’re usually left with many superficial contacts who probably won’t engage any further with you. It’s because you’re looking at the wrong metrics to make your marketing decisions. You thought, my goal is to come away with X number of leads. Wrong. Your goal should be to come away with X number of sales. The quantity of leads doesn’t matter if they are the wrong leads. The traditional funnel doesn’t work anymore. Casting a wide net doesn’t yield the results it should, and like I mentioned, it’s put too much importance on pre-conversion metrics that don’t mean a thing in the long run. Instead, it’s time to pay attention to the flip the funnel movement. 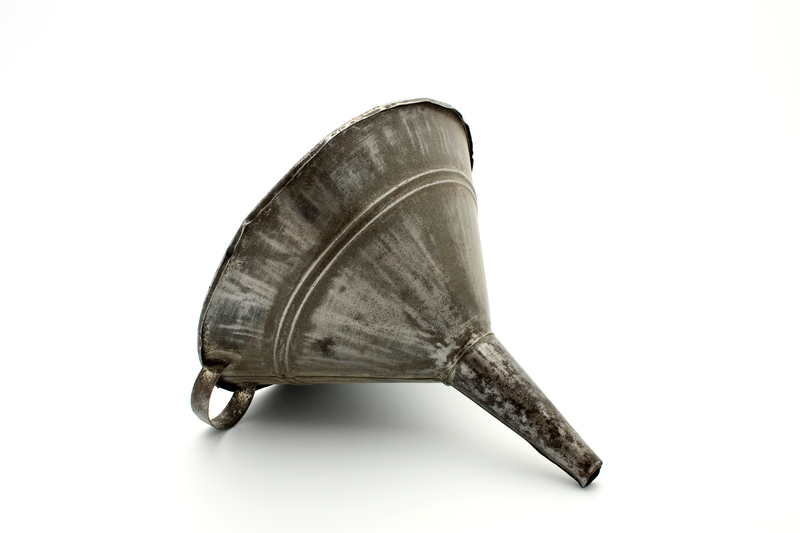 Traditionally, your funnel looks like this: Awareness, Interest, Consideration, Purchase. The problem with this is these focuses have led to buyers being lumped into buckets, rather than the stages representing a purchase cycle mentality that remains constantly cyclic. If you focus on numbers over actual behavior, you assume customers will always follow a linear path and as a result, you ignore the fact that people do things the way they want to do them. A more account-based approach changes the focus to the customer experience and looks like this: Identify, Expand, Engage, Advocate. This is a little closer to reality because the buying journey is encapsulated within the ‘engage’ stage. No longer do we confuse behavior with counts of people. Instead, we qualify buyers upfront by only allowing sales and marketing teams to focus on pre-identified sets of accounts. What happens afterward becomes less about qualifying an account and more about sparking a buying cycle – as it should. In short, it treats the buyer like the people they are, and helps you understand—and market to—people as they engage in more realistic buying behaviors, not clicks or opens but conversations. What happens when customers feel valued and appreciated by a company? They tell their friends. That Advocate phase is powerful—it’s the point at which your job as a marketer or salesperson becomes a heck of a lot easier. With a flipped funnel, you’re likely going to see all those other vanity metrics go down. But, you’ll see the really important number—conversions—go up. That’s when it hits you: the realization you’ve spent much of your career measuring the wrong things. If you’ve ever attempted to present a click-through report to an executive this should come as no surprise. The metrics within the silo of marketing have a very short half-life when removed from those confines. Fortunately, as our recent benchmarking report revealed, marketers are clamoring to embrace a quality over quantity message as 96% stated it is their primary focus heading into 2017. Eventually, common sense metrics prevail and the message to marketers is clear: Account Based Everything is here and gaining momentum every day, be careful what you ask for.